​Hi there! It’s been a while since the last update, so I’m writing this to let you know that yes, the project is ​not ​dead and still in active development, though there will still be some time until the next patch is out. My current goal is to finish up the Cafror region before pushing the next patch, which is starting to near completion in terms of map design, quests, items and NPCs. Below is a stitch of how it currently looks. The brown/gray blob in the top left is part of something else, so don’t worry about that just yet. 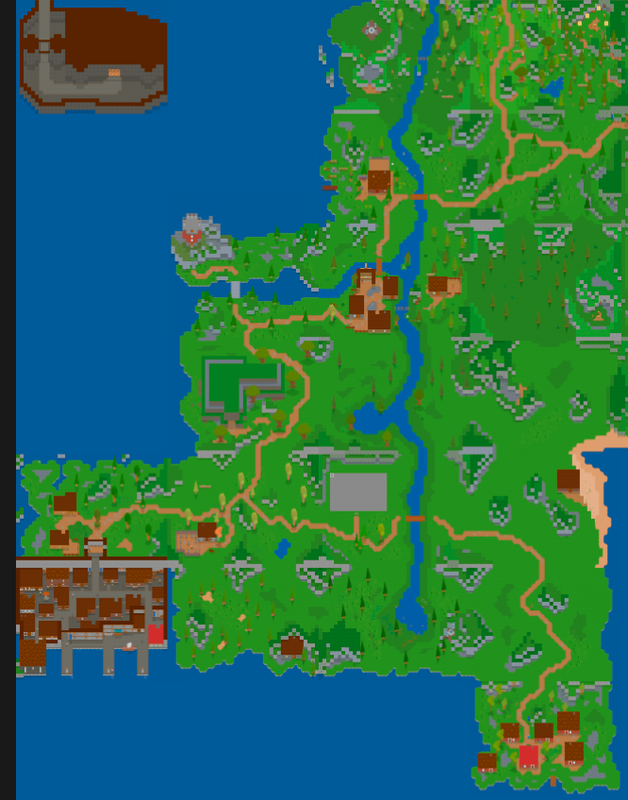 ​As you can see, it’s a rather large area, consisting of 19 overworld maps and a bunch of interior/cave/dungeon maps. I’ve been spending a lot of time on creating tile sets to make each location feel more unique, as well as polishing and fixing up the various clothes/armor sprites used on NPCs. Many of the older tiles have also been updated slightly, my art “skills” have grown quite a bit since they were drawn over a year ago. Please note that this GIF is a work in progress and not representative of the complete product.​This new map screen will make navigating much easier, as it properly marks your current location and displays all discovered locations (unless you have a map for that region, then it’ll show the most important ones). Custom markers is in progress as well, allowing you to mark locations for later, possibly with custom labels/notes for each. Exciting! That’s all for this post. Make sure to stop by the Discord server​ and/or follow me on Twitter​ for updates outside of this devblog. Two weeks of Tales’ beta is almost over. The feedback has been amazing, and way above any expectations I could ever have imagined. Over the week it has received over 150 views and over 60 downloads. Thank you all so much for taking the time to play and a massive thanks to those who have reported bugs. And last but not least, thank you so much to those who have donated to the development, even when you could have gotten the game for free. You people rock! It gives me the willpower to keep working on it. Since Itch has its new feature with Devblogs, that’s where I’ll be posting the patch notes. This blog will instead be more focused on the content to come, plans and more in depth posts about what is currently going on with the development. Down below you’ll see some of the plans that are made for future content, coming out later this year. Building your own house in games is fun. And because of that, I’m currently prototyping a custom housing system that will allow you to draw out walls for your own house in Tales of Astya. It’s far from done of course, but you can expect to hear more about it in the coming weeks. Currently there’s only one ship in the game, and it only sails to one destination. The plan is to expand this to have more ships that sail between the ports so you don’t see the same ship names every time you visit a place. Not a massive thing and not really noticeable, but it adds a little more depth to the world which is always nice. That’s all for this post. Before it ends, there should also be a new patch coming out this week, expanding and fixing the crafting systems in the game considerably with new recipes, ingredients and places to perform the crafting. Until then, have a good one! For the past two weeks I’ve spent a lot of time working on a variety of spells for the player to cast, both useful and not-so useful. As usual there’s also a lot of other additions near the bottom of this post. The biggest thing of this weeks post is the new trailer I made and published earlier this week. It doesn’t represent all the things you can do in the game, but it should give a decent idea of what’s going on. I hope you like it. I am planning to make more videos in the time ahead, hopefully with better editing. Blink – instantly teleport a small distance in whatever direction you’re facing. Bend Time – Slows down time 50%, but still allowing you to move at the same speed. Attacking cancels the effect. Candlelight – Spawns a glowing light orb above your head that lights up around you for around a minute. There should be a video demonstrating the magic in not too long. Public beta in TWO weeks! Tales has been in development for a while now, and it’s almost time to enter beta! The beta is planned to start on June 9 over at Itch.io. During this time the game will be available for free, with optional purchase for those who want to support further development. Once the beta is ready I will make another blog post annoucing it, including a download link and some instructions on how to report bugs/errors/glitches/feature requests(within reason). I’m very excited to have strangers play it and not just friends and get some feedback on what is currently in the game. No time frame has been set for how long the beta will last. New dialogue screen preview. Please excuse the prototype art. This is a consideriable amount of work, as each dialogue box has to be manually replaced. I have no estimate for how long it will take to update them all, but the current goal is to have most of it done by the time of beta. Finally got save/load game to work properly in general and fixed issues with party members not spawning properly. Shop owners will now throw out the player if they are inside their shop at closing hours. Added space telescope for exploration of constellations and the Astya night sky. That’s it for the past two weeks, hope you enjoyed. Next post will mostly be dealing with the beta and some instructions related to reporting bugs and all that. So long!